Since the very beginning, the mission of RTU Riga Business School (RBS) has been to educate managers and build leaders who create sustainable prosperity in the Baltic region. Professional management and leadership contributes greatly to the well-being and sustainability of the region. Therefore, RBS announces an initiative to support individuals in public, voluntary and governmental sectors in their missions and to contribute to the development of current and future leaders for public sector by providing members of these organizations a tuition fee waiver of up to 50% for studies in the RBS Executive MBA program starting in January 2019. The growing trend for public-sector managers to hold the MBA qualification shows a clear indication for the necessity for MBA skills and mindset for moving toward successful career development. The skillset and mindset taught by MBA programs are in high demand as they provide strong leaders and skilled managers the capability to adapt to a fast changing environment, have innovative and creative minds and the ability to apply fresh strategic approaches to a wide range of issues. Studies in Executive MBA program at RBS during my career at the Ministry of Economics provided me with three benefits: first, knowledge of the latest management approaches allowed me to complete assigned tasks more effectively; second, understanding global challenges and opportunities facing companies helped in shaping policies for the country’s competiveness; third, contacts and experience working with corporate leadership increased efficiency in corporate governance and management of state-owned enterprises. I recommend my colleagues from state institutions to consider the opportunity to study together with corporate leaders at RTU Riga Business School and increase their work efficiency and speed of career development. Tuition fee waivers will be granted to a limited number of carefully selected candidates as the offer is intended for individuals whose professional activity is solely related to public administration, non-governmental organizations or diplomatic activities. RBS reserves the right the refuse tuition fee waivers to candidates based on the Candidate Selection and Admission Committee decision. 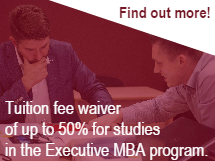 To qualify for a fee waiver, candidates must meet the requirements of this offer and admission criteria to the EMBA program. Please submit the application form by December 18, 2018. More information on the program content and calendar is available here. Information on tuition fees you will find here.